Kulmbach was a German artist who studied under the painter and printmaker Jacopo de’ Barbari (1445 – 1516) in Nuremberg, but more prominently in Albrecht Dürer’s (1471 – 1528) workshop. Dürer and Kulmbach collaborated closely and Kulmbach took up many major altarpiece commissions after his teacher retired from that method. Kulmbach also implored a unique style in his landscape depictions, influenced by the pioneering style of Albrecht Altdorfer (1480 – 1538). He painted the famous Saint John Altar in Kraków, Poland, additional to his works in Nuremberg. In the latter he painted his Saint Nikolaus at Saint Lorenz altar and another altar in Kraków, Saint Mary. His paintings and designs for stained glass were rich in color and showed gentle representations of humanity in the Saints. 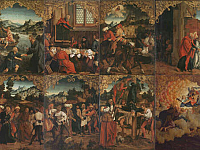 Of his other works in Kraków was the Stories from the Lives of Saints Peter and Paul, a polyptych from 1514. 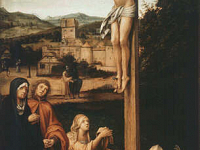 This piece, along with his Crucifixion with Mary Magdalen and Donors, now hangs in the Uffizi Gallery. His stained glass pieces, commissioned by The Emperor Maximilian I and Margrave Casimir Hohenzollern, were praised works.